Centar za razvojnu politiku i saradnju (CRPS) ima zadovoljstvo da vas pozove da se prijavite na konkurs za omladinsku razmenu “ Faces of the 21st Century: Draw your own future!” koja će se održati u Postdamu, (Nemačka) od 31. oktobra do 09. novembra 2014. godine. Pravo prijavljivanja i učešća imaju svi mladi iz Srbije starosti od 18 do 28 godina. Prijavljivanje se vrši popunjavanjem aplikacione forme (ispod), za više informacija pišite isključivo na mail konkurs@crps.org.rs sa nazivom mail-a “POTSDAM”. Organizator snosi troškove smeštaja i hrane. Učesnicima će biti refundirano do 170 evra troškova puta. Planiran je organizovan prevoz iz Beograda. 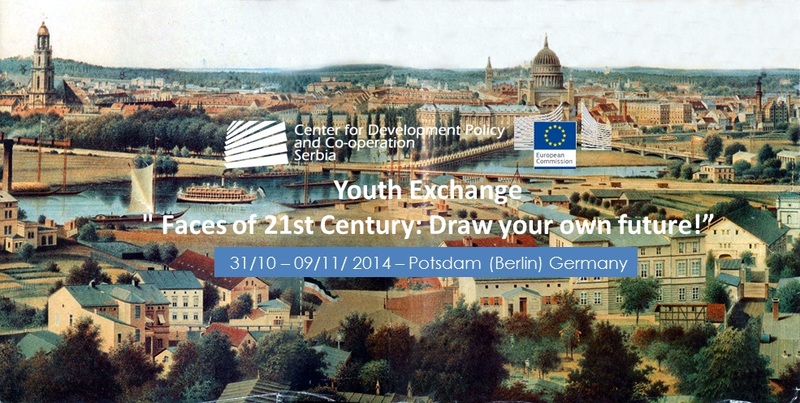 Youth exchange „Faces of the 21st Century: Draw your own future!“ organized by CRPS – Center for Development Policy and Co-operation will be held from 31st October until 9th of November 2014 in Potsdam, Germany. 40 participants from 8 countries will take part in it (Bosnia and Herzegovina, Czech Republic, Germany, Romania, Serbia, Spain, Turkey). “What is the European Community?“, “Who builds it?“ and “How do I become a part of it?“ – these are questions participants are going to deal with during our YE. Together we will reflect about the phenomena of communities on a local, regional, a national and a European level. We will analyze and discuss our roles as members in each of these communities. What does this mean for us as individuals and as European citizens? We imagine a peaceful European community based on the foundations of a democratic order and human rights, with active citizenship and solidarity among each other, with a lively intercultural dialogue? But what do these terms mean in reality for each of us? Self-portraits are not simply the depiction of persons nor the reflection of the inner world of the artist. They also contain the image of the actual society and the conviction that artists their representatives have formed about it. By using the tool of self-portraits we want to direct the attention of our participants to the most important part of the community – the individual – ourselves. We will introduce the participants of this YE to the development of this genre on the basis of the works of famous artists within different historical contexts of our European history. We will then together become familiar with drawing techniques of self-portraits, with the importane of the composition of details. This YE will empower the participants to position themselves into the midth of their community. They will learn to define that role and to express their hopes and expectations but also their fears as citizens of a united Europe. In order to create an inspirational atmosphere and to catch the muse, participants will visit ateliers, will meet different alternative artists and street art performers in Potsdam and Berlin. Self-portraits made by participants will be exhibited in an own organized and advertised exhibition in the city centre of Potsdam.